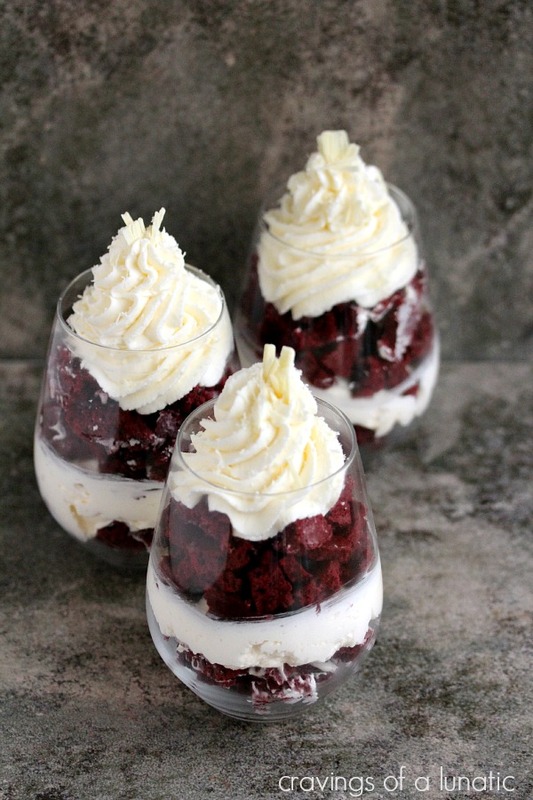 These red velvet parfaits are super easy to make and look lovely on any holiday table. Use leftover cake or whip up a cake just for these parfaits! Okay peeps, y’all know I am always honest with you. This was NOT supposed to be a parfait. Not even kidding. It was supposed to be a cake roll. Unfortunately I had trouble rolling the cake roll so this recipe was altered to hide my oops. It’s what I do. When in doubt “parfait it”. 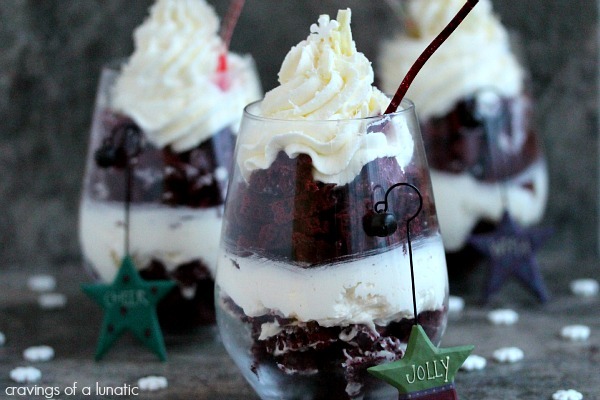 I’m not sure what that says about the fact that I have a zillion parfaits on my site. I made Michael Symon’s Mo Mos recipe. Then I realized I forgot an ingredient. Nothing crucial, unless you want to, you know, roll a cake. I forgot to add the extra egg whites which is sort of crucial to a good recipe for cake rolls. I’m determined to try again but in order to celebrate with my Holiday Party Peeps I had to make the best of a bad situation. So head into the kitchen, screw up a cake, then make these parfaits. Don’t you just love good advice? 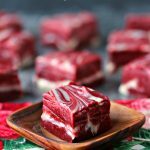 Super easy to make, and looks lovely on any holiday table. Spray cookie sheet (or sheets depending on the size of yours) with non stick spray, then line with parchment paper and spray again. Set aside. Place a small sauce pot of water on the stove and bring to a simmer. In your stand mixer whisk together the eggs, sugar, vanilla, and melted butter for 1 to 2 minutes, mixture should be combined well. Transfer mixture to a glass bowl and place over the simmering water on the stove (set aside the mixing bowl as you'll need it again). Whisk while cooking until the sugar dissolves. Transfer the mixture to the mixing bowl again and place back on the stand mixer. Now whisk until light and fluffy, this should take about 6 minutes. In a medium sized bowl whisk together the flour, cocoa powder, baking powder and salt. Add the flour mixture slowly to the mixer and only allow it to mix long enough to incorporate the dry ingredients. If using one big cookie sheet (I have one of those massive ones, if yours are small use two) pour it all on the sheet and smooth it out. If using two sheets divide the dough and spread evenly over both cookie sheets. Place sheet, or sheets, in oven and bake for about 12 to 14 minutes. Allow to cool and break into small pieces for the parfaits.Set aside. In a stand mixer combine sugar and butter , whisk on low speed until well blended. Now increase speed to high and whisk for about 3 minutes. At this point it should be fluffy. Now add the vanilla, cream, and salt. Whisk for another minute. Set aside until your ready to stack the parfaits. In a stand mixer combine the heavy cream and sugar, whisk on low to start then increase to high until the whipping cream is fluffy. Transfer to piping bag if desired. If not you can spoon the cream over top. Use a peeler to shave some chocolate pieces, or zest some. You can do this in advance or right over the top when the dessert is ready. 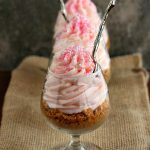 In 4 parfait glasses add one layer of cake on the bottom. Now add the icing over top. Press down a bit with a spoon. 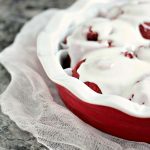 Now add the whipping cream layer. Serve with a big old "they'll never know I screwed up and this was suppose to be a cake roll" smile! These are fabulous. Sometimes you just have to go with it when you make a mistake. Take a bad situation and make it better. So the moral of the story is when in doubt “parfait it”. 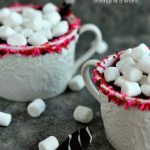 Make sure you stop by all my Holiday Party Peeps posts. Show them some serious love. They deserve it. I want, I want, I want. You need to make more mistakes if this is how they turn out. The sign of a good cook is one that can adapt. Cake roll or parfait? It would all be good in my tummy! It’s great when a little oops winds up turning into something so good. These parfaits sure do look mighty tasty. It’s still yummy either way! That’s a great philosophy – parfait it! 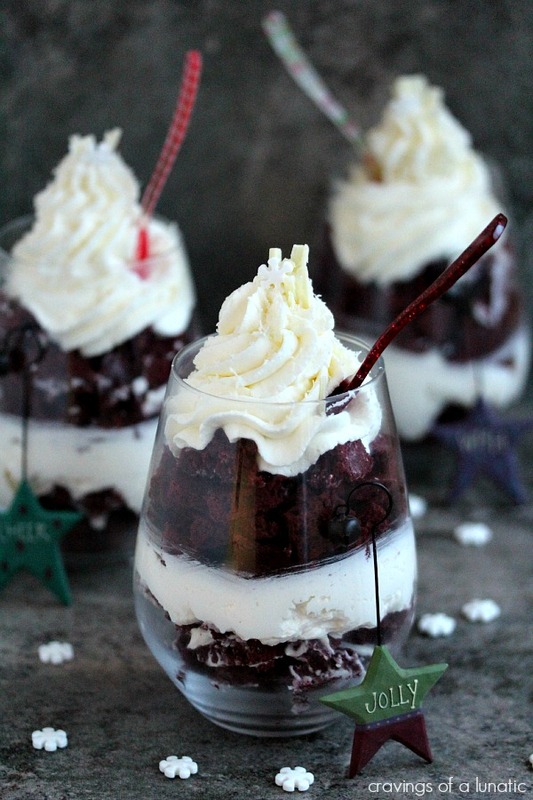 Forget dreams of sugar plums dancing in my head I want red velvet parfaits dancing in my dreams! Delish! Pinning for later! I became an expert at rolling cake at school last year. IT WAS VERY STRESSFUL. But now I can roll like a wizard. Call me next time you need some help. I’ll recreate the most stressful situation possible. And you will learn, dammit. YOU WILL LEARN. I love you woman. I wish we were neighbours. The bloody shenanigans would be news worthy. Sometimes kitchen accidents are the best ones. 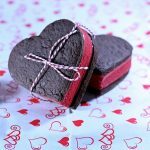 These are so pretty and I’ll bet they taste just as good! Your oopses always turn out tasty and gorgeous to look at. Mess ups happen to us all – at least you were able to salvage it into something delicious. I’ve had many times where the garbage enjoyed my recipe. Cake rolls are so hard, usually mine fail about 2 out of 3 times! This recipe looks like a great solution! 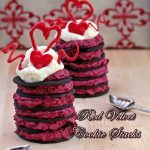 Screwed up cake or not, you always make awesome looking parfaits and these are no different! I coming to your house with my next kitchen oops, these look delicious! I’m a newbie to parfaits. What size cups/glasses did you use. I didn’t realize there were so many to choose from!